Green is the new black this holiday season. Feed his need to make the world just a little less vulnerable for his kids who will have to live in it with these unique gifts that are also fun and useful. 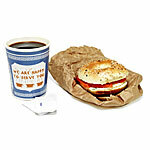 Ceramic coffee cup – $12 If you’ve ever spent any time in New York City, the humor of the ceramic version of the omnipresent Greek diner coffee cup will not be lost on you. Zapino Electric Scooter – $2995 – Even a Prius doesn’t say energy conservation as the combo of solar cells on your roof and a little electric scooter in your driveway. 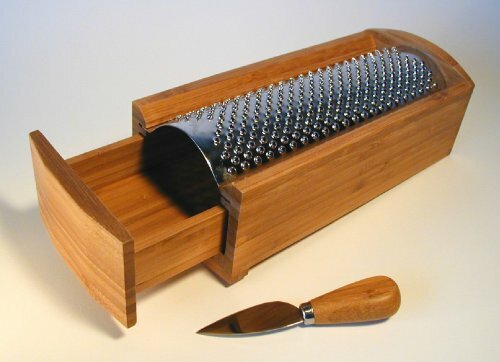 Enrico Cheese Grater – $47.95 This is a Great gift for the cook who is also green-conscious. This beautiful tool is hand crafted using incredibly hard, renewable Moso bamboo, the hardest bamboo species available. Biostack Composter- $129 Finally a place to put all the B.S. – in this easy to use Bio-stack compost bin, that will save his back while saving the world.